Your anniversary party food is going to be a big part of your celebrations. But where do you begin in making your food choices? and where the party itself is going to be held. Once you consider these, you may come to the conclusion that preparing the food and serving it will be more than you can handle. If this is the case, you may want to hire a caterer to help you with the hard work, or all of your family and friends together could put together a great feast. Even with the help of a caterer, you may wish to serve the anniversary party food choices in a buffet style. This way it makes it easier to serve lots of different food choices and tastes. It can make it handier to prepare some food choices in advance, too. Some simple and easy buffet choices that would make any anniversary party celebration a hit could include such popular items as: salads, quiche, sausage rolls, cold meats, fish, dips and rolls. 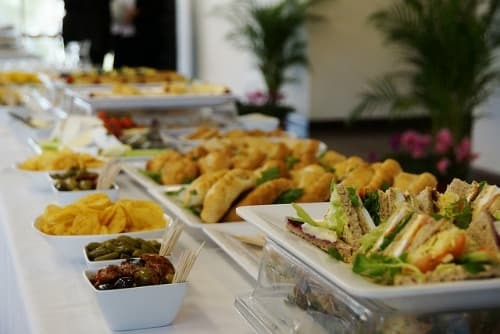 Many people choose not to serve sandwiches on a buffet because they have a tendency of becoming dry and hard, plus they take ages to prepare in a big quantity. One big hotel I used to work at would buy in the sandwiches ready made rather than have one of the chefs spend the afternoon making them. If you are not having the event catered, you can make the buffet a little easier to prepare by adding some platters all ready prepared. These are sold at lots of supermarkets. 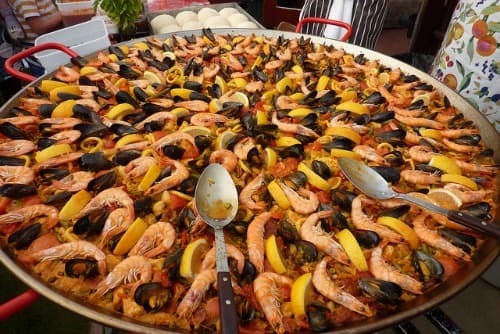 If you wish to spend more money on your buffet, you could add a platter of seafood, platters of cold meats and a hot dish or two. Many people love the idea of having a theme that goes along with their anniversary party food choices. The theme could be food from a certain region such as: Thai, Spanish, Italian, Chinese or Indian. You can even serve these food buffet style, too. If there is a beloved restaurant in your area that serves the theme food you choose, you may even want to pick up a hot dish or two from them to help finish off your buffet. If you happen to know the types of food choices that were served on the actually wedding day of the couple celebrating, you could bring your guests back in time by serving as many of the same dishes as were served on that day. It would be a fun, especially for the happy couple. Plus, it will be a great way for the couple to reminisce with the party planner. Finally, if the anniversary couple is known for a favorite dish or dessert, it would be an additional perfect dish to serve. If you could coax the recipe from them to share with their guests, it would be even more special, as long as it isn't a closely guarded 50 year secret. Yes, the party food is essential to every party, but it doesn't have to be expensive and as long as there is enough and not horrible, then the party is sure to be a hit. Lots of inexpensive menu ideas that would be perfect for an anniversary party. Cocktails and canapes - time your party for after dinner! If you are planning on catering your party yourself then you will want to do to it so you can also enjoy the party. Having a more relaxed informal party will be less stressful and any of the ideas above will lend themselves to the anniversary theme.